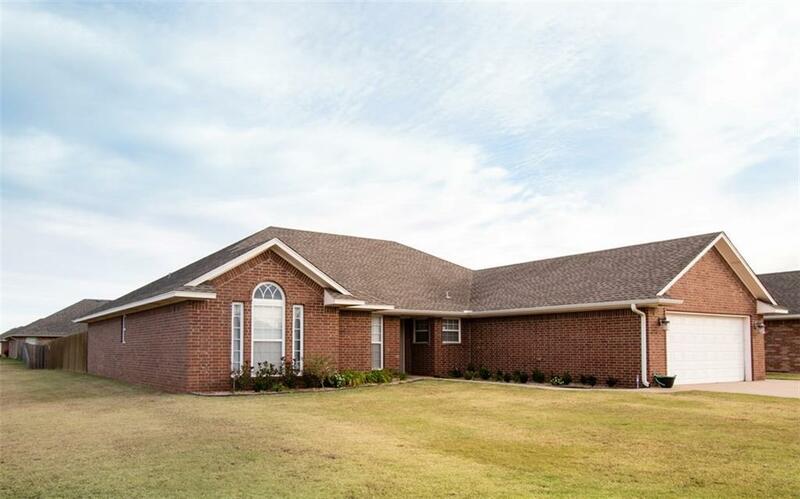 1801 Foxtail Circle, Altus, OK.| MLS# 842489 | CENTURY 21 Altus Prestige Realty, Inc. SELLER IS READY TO WHEEL AND DEAL!!!!!!!!!! Come take a look at this corner property that comes with 4 bedrooms/split plan, 2 full baths and a 2 car garage. Completely open living, dining & kitchen areas have windows across the entire back wall overlooking the backyard. The living area has a gas fireplace and newer ceramic tile flooring that looks like wood to give some separation from the dining and kitchen areas. The kitchen, dining, halls, baths and laundry room all have ceramic tile flooring. The kitchen comes equipped with a SS electric oven/range, microwave, dishwasher, breakfast bar AND under cabinet MOTION ACTIVATED lighting and some pull out shelving in the lower cabinets. Both baths have double sinks! The backyard is surrounded by a wood privacy fence, sprinkler system AND a 22 ft above ground pool and equipment. Water tank replaced in June 2018 and the dishwasher & microwave replaced in the last year. Another plus is home plumbed for a water softener!